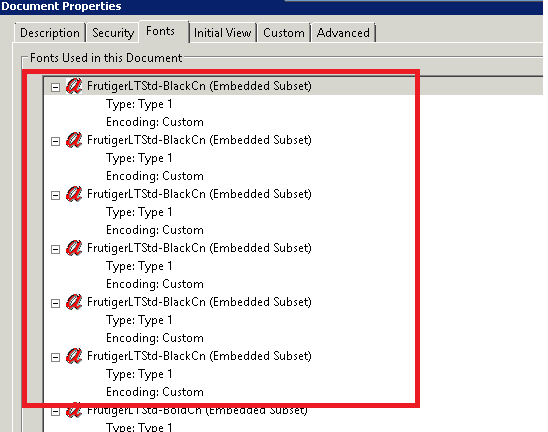 It tells you that the same font is included many times in the resulting PDF document. This will take up more space in you should try to avoid this. The reason behind this behavior is that you are including a subset of a font every time you append a new PDF. If you use characters from the font that you didn’t already have in an included subset, it will include a new subset. You can fix this by selecting to include the full font when you create the first PDF or the first time it is used. 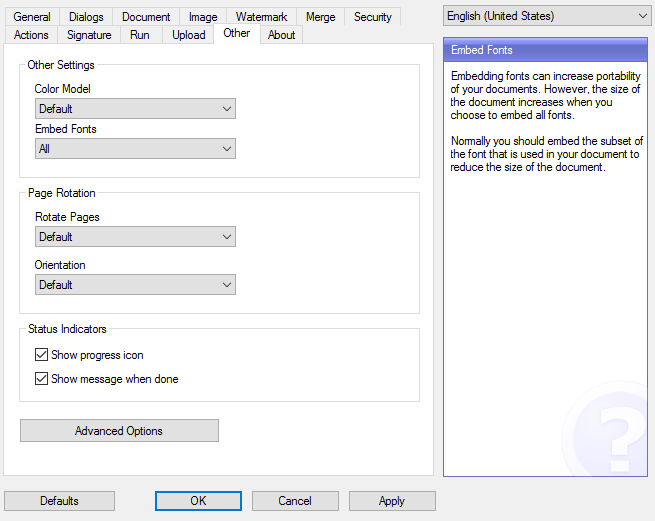 To do this, you should open the options dialog and select “All” in the Embed Fonts setting. Keep in mind that changes through the options dialog only affects the logged in user. If you want to force a setting for all uses you should add the following lines to your global settings file. Sometimes you can experience font problems when printing to PDF. Many different problems can cause fonts to be missing, render as boxes or look like strange unknown characters or artifacts. Usually font problems are related to specific application. 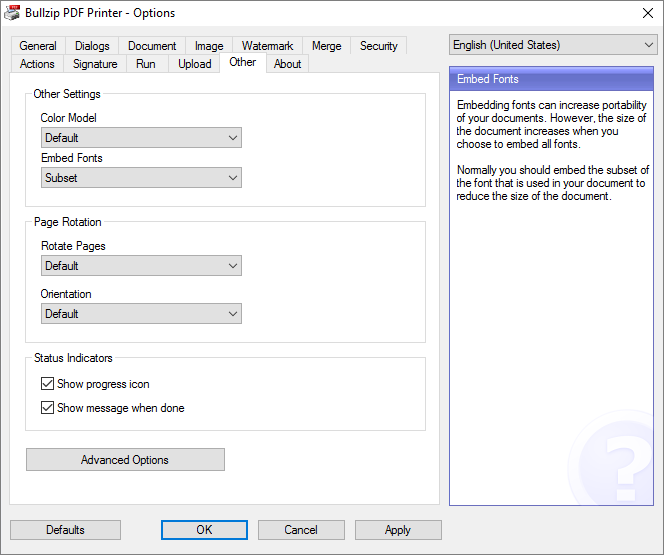 Some applications may be using the Windows print system in a different way than other programs. This can cause font problems that only occurs when printing from these systems. Here are some tips on what you can try to solve the font problems. The PDF printer supports different levels of font embedding. When you embed a font in your document then the information about the fonts are saved with your PDF file. When fonts are not embedded then the PDF may show strange things such as small squares or nothing at all when you open the PDF. By default, the printer embeds the characters that are used from the fonts in the PDF. You can change this setting from Subset to All and hope that the extra font information solves a font problem that you may be experiencing. Font embedding is changed in the Options dialog. The second thing you can try is to change the TrueType font download option in the printer’s advanced settings. It is set to Automatic by default but changing it to outline may solve the missing fonts problem. Normally, you can get to this dialog when you print. In the Print dialog where you select a printer there is a button named Preferences. Click that button and then click the Advanced button. 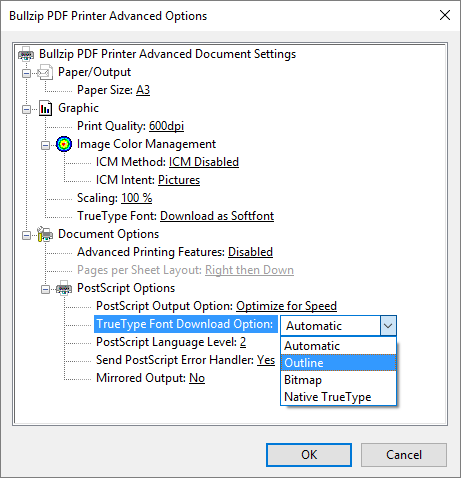 If you want to change the default behavior to outline then you should open the Advanced Options dialog from the printer properties in your list of printers. On the Advanced tab, you can set the printing defaults.